Rainbow Bridge gained a beautiful little angel on May 1, 2018. We lost Suzanne and part of our hearts that day. She came to us 9+ years ago. A skinny little waif who decided to make our home her home. So little, but so fierce and independent. She would come in once per day, meow loudly in our Franklin's face (our Turkish Van), whirl around and leave. This went on for several months. Slowly she gained confidence and trust in us. 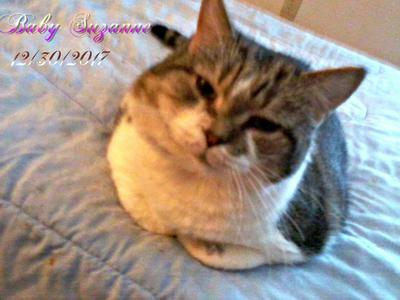 We brought her and her buddy Oski in, in Sept. 2009. She endured so much from the local tom cats. It was time to come in and be home. After her "Big Day" (spaying), she blossomed into an absolutely beautiful young kitty. She settled in and became an essential part of our home. She had a nickname... Rocket Tail. She earned it by revving up and flying up and down the stairs and all around. She was an imp. She and Oski came into our home at the same time. They were abandoned kitties who stayed together always. However, she would bully him sometimes. 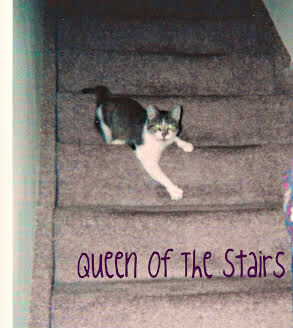 She was queen of the stairs. She stayed up at the top and watched for Oski. When he acted like he would like to come up the steps and explore the rest of the home, she nixed that quickly. It was comical because he was 15+ lbs., and she was 6-7 lbs. She totally flummoxed him. She also made him stay in the kitchen-dining room area for a month or more. He would not cross the threshold from the dining area to the living area either. She finally relented and "let" him. The years rolled on and Suzanne became a most gracious kitty. She would take Oski to task if he acted up a little too much (a swift bop on the nose). She wanted peace and quiet around the house and did her very best to achieve it. We gained two more kitties during these years. We became the new home for Rosie, a gleaming black cat, who came to us and decided to 'pitch her tent' here. She was 1-year-old when we met her and took her into our home. She must have Siamese in her, because she talks incessantly and even mutters to herself at times. She was much too loud and a total distraction as far as Suzanne was concerned. Suzanne never got on the Rosie bandwagon. So she ignored her for the most part and hissed at her on occasion. Then came Nancy June, an absolutely beautiful Siamese kitten. Actually she is only 1/4 Siamese but looks and acts 100%. Suzanne didn't mind her so much. We speculated that Nancy reminded her of one of her kittens from long ago. Suzanne and Mr. Franklin were always kindred souls. He loved quiet days of basking in the sunlight through a patio door or window. So did she. Suzanne truly was a homebody. She and Franklin never hassled one another. They really respected each other. We lost Franklin last year (a stroke). Suzanne mourned for him. She would look every day for him in all his old haunts. She was puzzled and hurt that her friend of many years had left us. She very slowly came to the realization that he had gone away. She loved to be groomed. All you had to do was run your hand over the bristles of the brush and she came trotting in. That was some of the best bonding time ever. She would purr so loudly, it didn't seem possible that such a small cat could produce such a big, robust sound... but she did. She had a habit of holding one leg up, ever so daintily, and making sure it got the full grooming treatment. It was her "Lady Leg " as we referred to it. The home seems empty, even though we have the three other wondrous kitties. They do their best to console us. They miss her too. We will go on, but with a heaviness in our hearts that will be lifted when we reunite with all our little friends at the Rainbow Bridge. 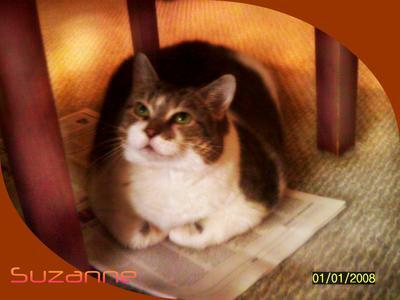 Appreciate your sharing a celebration of a beloved kitty and may it lighten your hearts - I just love Suzanne’s comedic life too. RIP beauty. Suzanne was very beautiful and sounds like she had a wonderful personality. She was so lucky to have found you for her forever home. I can tell you thought the world of her.